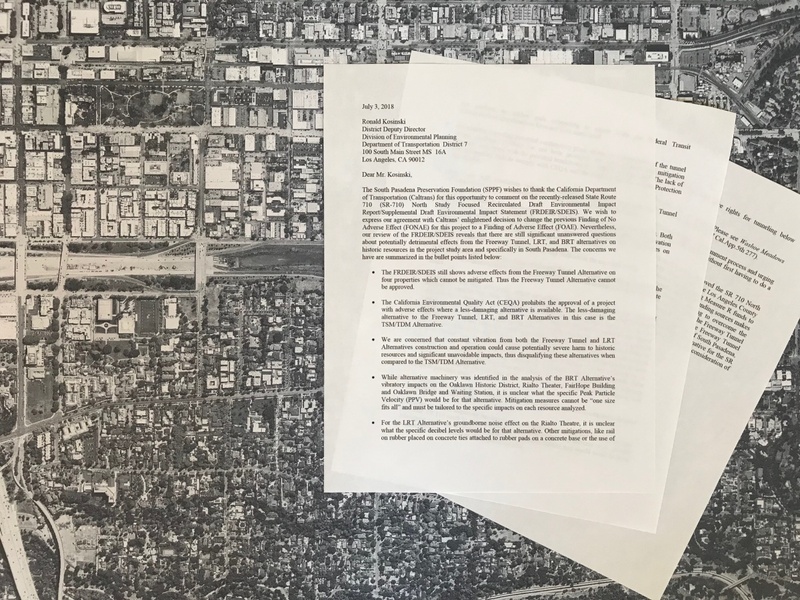 The South Pasadena Preservation Foundation attended the hearing regarding the supplemental Environmental Impact Report (FRDEIR/SDEIS) for the 710 extension on Wednesday, June 18. The two hour meeting was held at Maranatha High School and largely covered the cultural impacts that a 710 project would have on historic homes in Pasadena, South Pasadena, and the East Los Angeles area. The presentation and hearing of CalTrans’ Supplemental EIR was held at 6:30. A comment period followed after, in which attendants were given two minutes to speak. Many of the people who spoke expressed their concerns and pointed out many problems and issues with the FRDEIR/SDEIS . The hearing process itself was in question by noted attorney Christopher Sutton who fiercely scolded the Caltrans/Metro leadership for mishandling the basic process of the hearing and, in his public comments, defined several crucial issues in the FRDEIR/SDEIS. Details to follow in a followup report. Notably, South Pasadena Preservation Board Members Vice President, Mark Gallatin and Treasurer Odom Stamps were in attendance for the hearing. Some residents spoke at the event, and other members sent in written letters of complaint. • The FRDEIR/SDEIS still shows adverse effects from the Freeway TunnelAlternative on four properties which cannot be mitigated. Thus the Freeway Tunnel Alternative cannot be approved. • We are concerned that constant vibration from both the Freeway Tunnel and LRT Alternatives construction and operation could cause potentially severe harm to historic resources and significant unavoidable impacts, thus disqualifying these alternatives when compared to the TSM/TDM Alternative. • While alternative machinery was identified in the analysis of the BRT Alternative’s vibratory impacts on the Oaklawn Historic District, Rialto Theater, FairHope Building and Oaklawn Bridge and Waiting Station, it is unclear what the specific Peak Particle Velocity (PPV) would be for that alternative. Mitigation measures cannot be “one size fits all” and must be tailored to the specific impacts on each resource analyzed. mitigations, like rail on rubber placed on concrete ties attached to rubber pads on a concrete base or the use of box sections on rubber pads connecting to tunnel walls per Federal Transit Administration specifications have not been considered. this information fails to comply with CEQA and the National Environmental Protection Act (NEPA). Alternative’s impacts and mitigation measures associated with tunnel fires. resources within the study area have not been addressed. • Caltrans has not categorically ruled out blasting methods in the excavation area. creates uncertainties in both cost and impact. The environmental impact of the Freeway Tunnel Alternative is currently unknowable because the project as proposed features unacceptable risks including construction safety problems and a high likelihood of needing a major redesign or realignment during construction with unknown risks of massive cost overruns and delays of possibly years. a detailed construction methods assessment. and near SR 110 north to Columbia Street. These curvatures will increase costs, present placement problems, increase the potential for ground failures and would result in more transferred traffic vibrations if the ground is firm. court in Washoe Meadows stated “The presentation of five very different alternative projects in the DEIR without the designation of a stable project was an obstacle to informed public participation for the reasons previously discussed, even if we cannot say such input would have changed the project ultimately selected and approved.” Instead of a clearly identified single proposed project, the FRDEIR/SDEIS presents a set of alternatives without any distinction between them that would allow public comments to focus on the relevant proposal, thus depriving the public and public agencies of the ability to provide comprehensive, meaningful comments on the document. We respectfully request that Caltrans recirculate the DEIR/DEIS with the preferred alternative clearly identified. County Metropolitan Transportation Authority (Metro) has allocated its remaining Measure R funds to the TSM/TDM Alternative. The elimination of these previously identified funding sources makes the Freeway Tunnel Alternative economically infeasible. Because funding to overcome the engineering challenges of the Freeway Tunnel Alternative is not available, the Freeway Tunnel Alternative is technically infeasible. For the reasons enumerated above, the Freeway Tunnel Alternative is also legally infeasible. We encourage Caltrans to join the City of South Pasadena, the SGVCOG, and Metro and focus its consideration on the TSM/TDM Alternative for the SR 710 North EIR/EIS to the exclusion of all other alternatives. Thank you for your consideration of our comments.